In anticipation of Rupert Garcia's show in early 2011 at the de Young Museum, "Rupert Garcia: the Magnolia Editions Projects," here is Garcia at the studio in 2003, working on his tapestry La Xochitl IV. 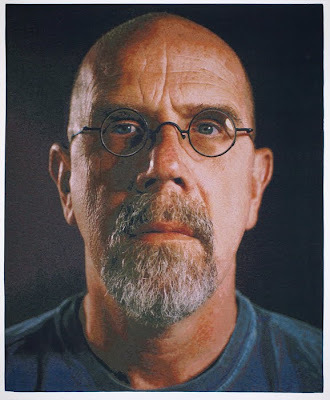 Chuck Close visited Magnolia Editions today to see the studio and to review some prototypes for new projects. Magnolia Editions published its first edition by Close, a tapestry portrait of Philip Glass, in 2005. 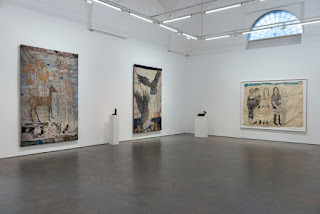 The artist's most recent edition with Magnolia is Brad, a 2009 tapestry woven from a daguerreotype of Brad Pitt. 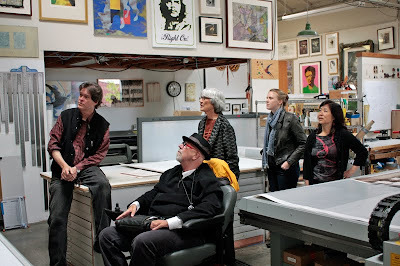 After weeks of visa delays courtesy of the British government, Faisal Abdu'Allah arrived in the Bay Area on Friday and visited Magnolia today to work on prints for his upcoming show, "The Art of Dislocation." 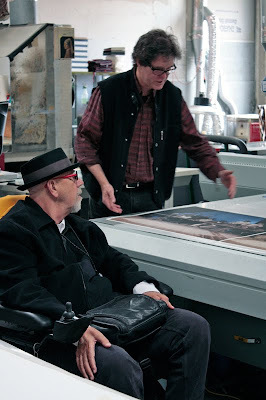 Abdu'Allah consulted with Stanford Art History Associate Professor Barbaro Martinez-Ruiz and Project Assistant Rachel Newman as he worked on prints on aluminum and paper. "The Art of Dislocation" opens September 28 at the Thomas Welton Stanford Art Gallery. Work for an upcoming show at Stanford University by British artist Faisal Abdu'Allah was printed at Magnolia Editions this week. 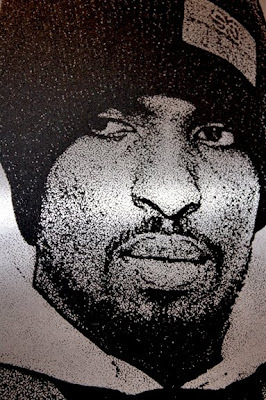 Barbaro Martinez-Ruiz, an assistant professor of Art History at Stanford, acted as Abdu'Allah's liaison; the artist was present from across the Atlantic ocean for proofing and decision-making via a Skype video connection on Martinez-Ruiz's laptop. 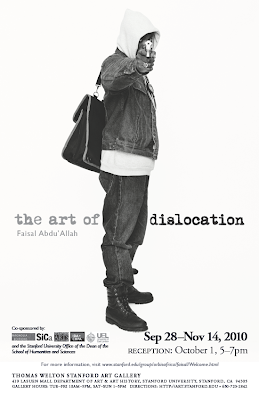 Abdu'Allah's show "The Art of Dislocation" opens September 28 at the Thomas Welton Stanford Art Gallery, with an opening reception on October 1 from 5 to 7 pm. collagraph and mixed media, 31.5 x 25.5 in. 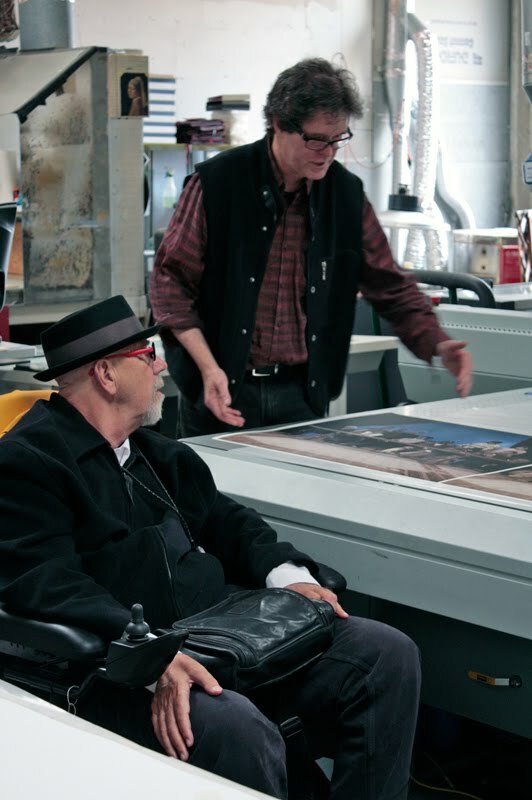 George Miyasaki has produced sixteen new prints in an edition variée entitled Between Accident and System, created at Magnolia Editions with printer Brian Caraway. 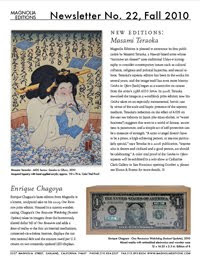 Miyasaki prints multiple layers from a collagraph plate and embellishes each print with color by hand, so that each work in the series has its own unique character. We highly recommend making an appointment to come see these prints in person; the variations in tone and color are worth experiencing first hand! Miyasaki is truly a master of his craft. 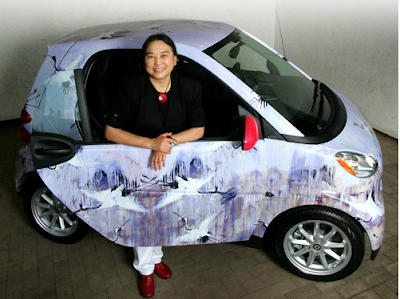 The Kemper Museum of Contemporary Art in Kansas City has teamed with Hung Liu to create a smart car covered in artwork by Liu. The car will be raffled off in October as part of a fundraiser for the museum. Magnolia Editions worked with Liu to select and configure imagery from various paintings into a composition designed specifically for the car's exterior. 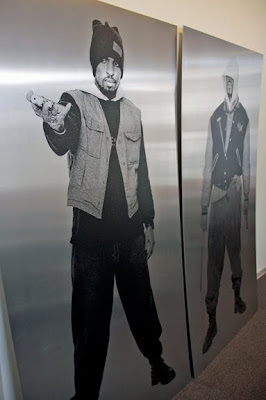 For more information about the raffle, please check the Kemper Museum website.